Starting with the statement that it is epidermal in origin, we will first consider the structure of the skin, and follow that with a brief description of the structure and mode of growth of the human nail, a short study of which will greatly assist us when we come to investigate the manner of growth of the horse's hoof. The Skin is composed of two portions, the Epidermis and the Corium. The Epidermis is a stratified epithelium. The superficial layers of the cells composing it are hard and horny, while the deeper layers are soft and protoplasmic. These latter form the so-called Rete Mucosum of Malpighi. Fig. 23. - Vertical Section Of Epidermis (Human). 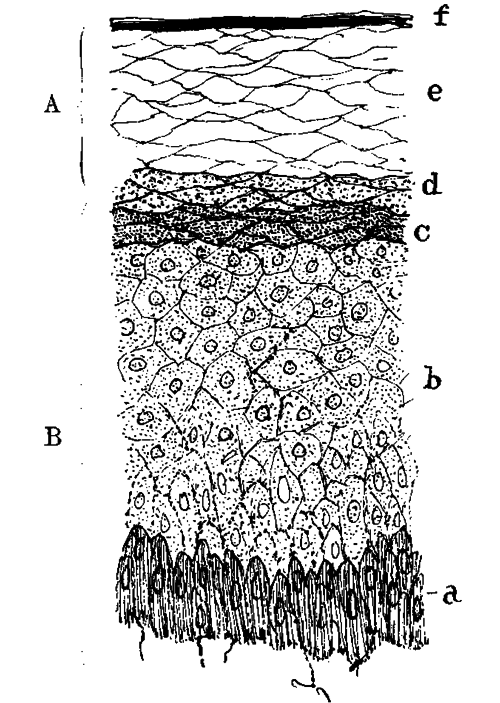 (After Ranvier) A, The Horny Layer Of The Epidermis; B, The Rete Mucosum; A, The Columnar Pigment-Containing Cells Of The Rete; B, The Polyhedral Cells; C, The Stratum Granulosum; D, The Stratum Lucidum; E, Swollen Horny Cells; F The Stratum Squamosum. Commencing from below and proceeding upwards, we find that the lowermost cells of the rete mucosum, those that are set immediately on the corium, are columnar in shape. In animals that have a coloured skin these cells contain pigment granules. Directly superposed to these we find cells which in shape are polyhedral. Above them, and forming the most superficial layer of the rete mucosum, is a series of flattened, granular-looking cells known as the stratum granulosum. Immediately above the stratum granulosum the horny portion of the epidermis commences. In the human skin this is formed of three distinct layers. Undermost a layer of clear compressed cells, the stratum lucidum. Next above it a layer of swollen cells, the nuclei of which are indistinguishable. Finally, a surface layer of thin, horny scales, the stratum squamosum, which become detached and thrown off in the form of scurf or dandruff. In the skin of the horse, except where it is thickest, these layers are not clearly defined. It is the Malpighian layer of the epidermis that is most active in cell division. As they are formed the new cells push upwards those already there, and the latter in their progress to the surface undergo a chemical change in which their protoplasm is converted into horny material. This change, as we have already indicated, takes place above the stratum granulosum. In addition to its constant formation of cells to replace those cast off from the surface, the active proliferation of the elements of the Malpighian layer is responsible for the development of the various appendages of the skin, the hairs with their sebaceous glands, the sweat glands, horny growths and the hoof, and, in the human subject, the nail. These occur as thickenings and down-growths of the epithelium into the corium. The epidermis is devoid of bloodvessels, but is provided with fine nerve fibrils which ramify between the cells of the rete mucosum. The Corium is composed of dense connective tissue, the superficial layer of which bears minute papillae. These project into the epidermis, which is moulded on them. For the most part the papillae contain looped capillary vessels, rendering the superficial layer of the corium extremely vascular. Why this must be a moment's reflection will show. The epidermis, as we have already said, is devoid of bloodvessels. It therefore depends entirely for its nourishment upon the indirect supply it receives from the vessels of the corium. The need for extreme vascularity of the corium is further explained when we call to mind the constant proliferation and casting off of the cells of the epidermis, the growth of the hairs, the production of the horn of the hoof, and the work performed by the numerous sweat and other glands. Others of the papillae contain nerves, ending here in tactile corpuscles, or continuing, as we have mentioned before, to ramify as fine fibrils in the rete mucosum of the epidermis. The Hairs are growths of the epidermis extending downwards into the deeper part of the corium. Each is developed in a small pit, the Hair Follicle, from the bottom of which it grows, the part lying within the follicle being known as the Root. It is important to note their structure, as it will be seen later that they bear an extremely close relation to the horn of the hoof. Under a high power of the microscope, and in optical section, the central portion of a hair is tube-like. In some cases the cavity of the tube is occupied by a dark looking substance formed of angular cells, and known as the Medulla. The walls of the tube, or the main substance of the hair, is made up of a pigmented, horny, fibrous material. This fibrous structure is covered by a delicate layer of finely imbricated scales, and is termed the Hair Cuticle. The root of the hair, that portion within the follicle, has exactly the same formation save at its extreme end. Here it becomes enlarged into a knob-like formation composed of soft, growing cells, which knob-like formation fits over a vascular papilla projecting up in the bottom of the follicle. We have already stated that the hairs are down-growths of the epidermis. It follows, therefore, that the hair follicles, really depressions or cul-de-sacs of the skin itself, are lined by epithelial cells and connective tissue. So closely does the epidermal portion of the follicle invest the hair root that it is often dragged out with it, and is known as the Root Sheath. This is made up of an outer layer of columnar cells (the outer root sheath) corresponding to the Malpighian layer of the epidermis, and of an inner horny layer, next to the hair, corresponding to the more superficial layer of the epidermis, and known as the inner root sheath.